Flexographic printing is everywhere, and has been for decades. You can see examples of it on candy wrappers, candy bags, snack bags, labels, cereal boxes, plastic shampoo bottles, peel-able double-sided medication labels, in your notebooks, legal pads, and desk calendars, and on your seasonal roll of printed paper towels. Almost everything printed today can be produced flexographically. It might seem like magic, but the steps to flexo printing are best explained as a carefully choreographed science, yielding a final printed product that is both beautiful and functional. The first step in flexographic printing is designing your artwork. Creating a design that fits the specifications needed to produce the final desired print can be challenging. Failure to thoroughly proof your artwork can result in costly mistakes. Image carriers cannot be changed once they are produced. When mounted to a printing cylinder, image carriers created flat stretch and distort your image. You can learn how to calculate and compensate for the distortion -- or opt for In-The-Round, continuous print image carriers that are distortion free. The rolling design of the flexographic printing press allows for continuous substrate materials (in roll-form) to be fed through the machine. 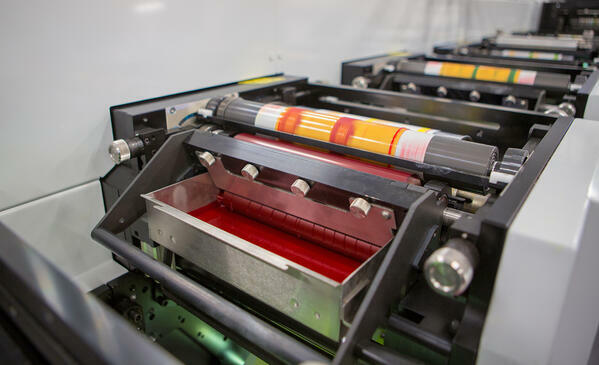 This feature of flexography is what allows for the continuous printing process that can achieve high speeds, maintain accuracy, and efficiently produce large print runs. Unwind and Infeed - A roll of substrate is fed into the printing press. Tension must be kept taught to prevent slack which can cause wrinkling, misregistration, web breaks, and other print defects. Enclosed Doctor Blade Inking System - A continuous cycling pump fills the enclosed chamber with ink. The ink is transferred onto the anilox roll with any excess removed by the doctor blade. The ink cycles in and out of the enclosed system during printing. Inking Anilox Roller - The anilox roller contains microscopic cells which carry a thin layer of ink from the inking system to the image carrier. Image Carrier and Impression Cylinder - The image carrier transfers the image to the substrate. The flexographic press pulls the substrate between the image carrier and the impression cylinder. Simultaneously, the impression cylinder holds exactly the right amount of pressure on the substrate for even ink distribution. Drying - The substrate winds through roller-less and plate-less sections to dry the ink. Depending on the number of colors used, the substrate might pass through multiple image carriers, impression cylinders, and drying sections in a single print run (one per color). Outfeed and Rewind - The final step on a flexographic printing press is the outfeed and rewind, where a substrate is rolled up again in preparation for a cutting die, which will separate individual prints. Making sure all of these steps run smoothly and defect free comes down to investing in the proper materials, and partnering with an image carrier manufacturer who can optimize your sleeves, cylinders, and plates for your printing needs.